So I went and added Xanathar’s Guide to Everything to my library, which I intend to mine for ideas, when running my tweaked Tomb of Annihilation campaign – and lo and behold, if not a reference to an old favorite D&D-module sprang forth during the reading of the book. 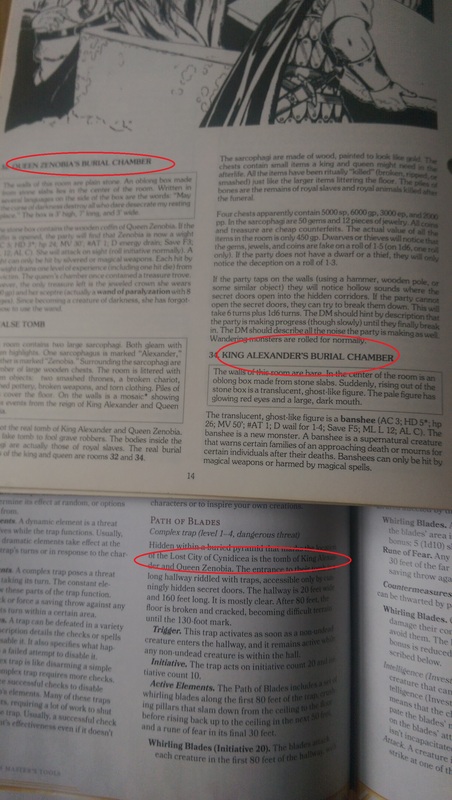 D&D 5th edition contains several call backs to earlier D&D-material, for instance they happily namedrop older settings in their campaign books even though the default setting is Forgotten Realms, but they also add small touches here and there referencing various characters, details, events and such from older modules. For instance the Monster Manual in the goblin section, they reference ‘Bree-Yark’ from module B2 Caves of Chaos, and in the Players Handbook a table of random items contains wines from module B7 Rahasia. And being both a D&D becmi and a Mystaran fan this warms my heart. Likewise I was pleasently surprised, when I discovered that Xanathar’s Guide to Everything caries a reference to B4 The Lost City. In the DM section the chapter on traps includes a deadly trap found in the Lost City of Cynicideans near the graves of queen Zenobia and king Alexander. These details are all taken from module B4, including the trap. I may not get Mystara back in published form, but at least I still get some references to some of my favorite stuff. Any other references to the B-modules in the D&D 5th edition material?